It's all picturesque. A large flock of chickens is busily pecking the ground for worms and bugs and tender blades of grass, just minding their own business. Then in the distance, an all-terrain vehicle is heard. >>Read More. The new Formax brand brings clarity to the quality that has long been associated with the Producer Feeds name. For years, farmers, rural dwellers and hobby farmers have looked to the Producer Feeds brand for the finest in animal nutrition, no matter what the species. >>Read More. Although Formax products are available in more than 150 feed and farm stores in Kentucky, Indiana, Tennessee and Virginia, we’re always on the lookout for quality dealers who can supply our outstanding rations to their customers. Formax offers competitive margins, exceptional dealer support including fast and frequent delivery, stock rotation and cooperative advertising. >>Read More. 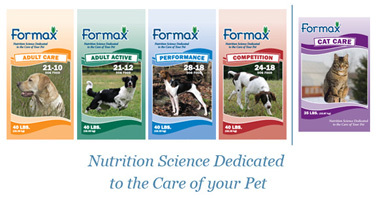 Contact the Formax Animal Care Team.